JIMI HENDRIX IN MOROCCO: THE FALSE STUFF! THIS TAKES THE BISCUIT! One addition to all this below: a holiday brochure which states (wait for it! ), that Jimi Hendrix, Cat Stevens and Bob Marley started a commune in Morocco! Rubbish, of course! All aboard the Mythology Tour! People in Morocco love storytelling and folklore. While it can be great fun to fantasize or (day)dream about things, it turns into a real nightmare when one wants to separate fact from fiction. Jimi Hendrixs short visit to Morocco during the summer of 1969 produced a mountain of erroneous information and fictitious stories. * In the late 1960s Jimi Hendrix made several trips to Morocco (source: liner notes for the CD Morocco: Crossroads of Time released by Ellipsis Arts, U.S.A., 1995). False! Fact: Jimi Hendrix visited Morocco just once. * Jimi Hendrix flew to Morocco in a small private plane. False! Fact: Jimi Hendrix flew on a regular flight from Paris to Casablanca with two (male) friends. * Jimi Hendrix travelled all over Morocco in a van and slept either in this van or in a tent. False! Fact: Jimi Hendrix stayed in three different upmarket hotels in three different cities. Fact: Jimi Hendrix hired a limo plus driver when he arrived in Casablanca. Just imagine Jimi Hendrix going camping, folks! * Jimi Hendrix stayed at Hotel Riad Al Madina (known as Hotel du Pacha in 1969) in Essaouira (source: bogus claim made several times by current management of Riad Al Madina, also during numerous travel programs on Morocco produced for TV over the years). False! Fact: Jimi Hendrix stayed at Des Iles Hotel in Essaouira instead. 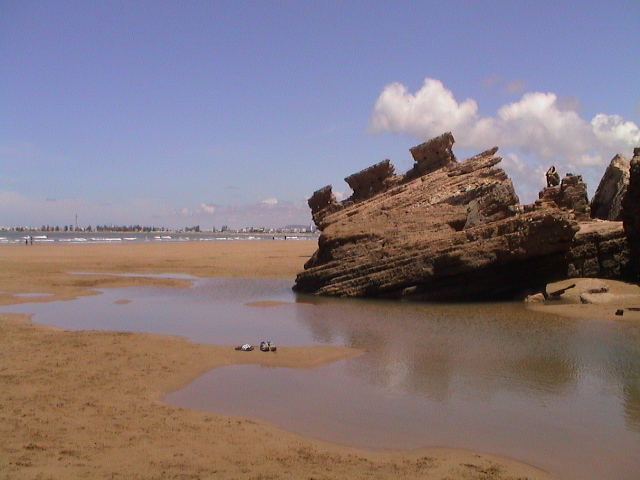 * Jimi Hendrix wrote Castles Made Of Sand after visiting the ruins [see photo below] of an old fort (known as the Bordj El Berod), half buried in the sand and part submerged at high tide, near the beach in Essaouira (source: many guide books on Morocco). False! Fact: Jimi Hendrix recorded that song already in October 1967 (released on the Axis: Bold As Love LP on 1 December 1967), while he didnt visit Morocco until July 1969! Go figure! * Jimi Hendrix ate in Restaurant du Port/Chez Sam while in Essaouira. False! Fact: The restaurant did not exist back in 1969. * 30 years ago this fall, I made my first overseas trip - to Diabet [sic], Morocco, a humble Berber village that Hendrix wanted to buy (source: The Washington Post, 21 January 2001). False! Fact: Jimi Hendrix didnt even visit Diabat! * Jimi Hendrix jammed with many local musicians while in Morocco. False! Fact: Jimi Hendrix didnt even take a guitar with him; remember, he was on a holiday, not on a concert tour! * Oh, we have a tape of Jimi playing in Morocco! (source: waitress Linda Hina to Caesar Glebbeek). False! * Jimi Hendrix wanted to adopt a Moroccan boy (just 7 years old at the time) and take him back to America. False! * Jimi [went] to Morocco with Stella and Collette to buy pillows and clothing and rugs. Friends say Jimi picked up all the bills, spending $10,000 on the trip and at least $20,000 more on the merchandise (source: Hit & Run: The Jimi Hendrix Story by Jerry Hopkins, p. 220). False! Fact: Jimi Hendrix did not travel with Stella and Collette to Morocco (they were already there!). Fact: Jimi Hendrix only took 2,100 dollars in cash with him for his holiday. * They wound up in Essaouira... Timothy Leary was there with a whole bunch of followers (source: Jimi Hendrix: Voodoo Child of the Aquarian Age by David Henderson, p. 321). False! Fact: Timothy Leary was not in Morocco during the time Jimi Hendrix was there. *Jimi Hendrix fathered many children while In Morocco! False! Fact: Instead, Jimi Hendrix enjoyed a romance with Collette Mimram while in Morocco. * Hendrix would later try to buy the island of Mogador off the coast of Essaouira, but the government stopped the sale... (source: liner notes for the CD Morocco: Crossroads of Time released by Ellipsis Arts, U.S.A., 1995). False! Question: What on earth was Jimi Hendrix gonna do with an island?! * Jimi Hendrix kept a diary while in Morocco. False! * Jimi Hendrix didnt like Morocco as it was too hot. False! Fact: Jimi Hendrix loved Morocco! "The people of Morocco have never recovered from Jimis visit and the tales are remarkable. Like George Washington he slept in everyones house around the Moroccan countryside!" (source: Deering Howe - who flew with Jimi Hendrix to Morocco- to Caesar Glebbeek, 28 January 2005. Nice one, Deering! ).